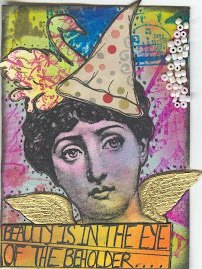 Lisa sparkle and stamps: Stampotique challenge- acetate. Acetate!?? ACETATE???? !!!!!! Stampotique challenge- acetate. Acetate!?? ACETATE???? !!!!!! 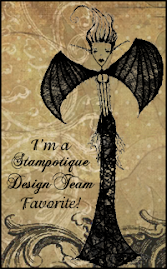 This week's Stampotique Designers challenge is to use acetate. Yep, you read that right, acetate. Now this is putting me so far out of my comfort zone I may as well be ice skating naked singing a Celine Dion song. Yep- THAT bad........ or is it???? Previous attempts with acetate always involved me stamping on it, with smudgy useless results, despite the YouTube tutorials, correct inkpads, all of that malarky. So this time I thought I'd use the acetate as an element on the card and not put an inkpad anywhere near it. Ha! Result! Take that acetate! Cutting out a section of the card and replacing it with acetate really works, and once that was settled I was free to enjoy making my card. Go me! I've had the idea for the background floating around in my head for months, ever since I acquired the Hexagon stamp- it involved lots of ink pads, lots of stamp cleaning and a stampamajig for placement. Love how it turned out though. Then.......horror of horrors, once I'd finished and was admiring my brilliance, I dropped a black ink pad onto the beautiful hexagons! Argh! After several choice words, I went into salvage mode and cut off some of the offending black and slightly shortened the card, then stuck some green raffia over the rest. Phew. You can see the raffia on the photo below, just about. The Monsters- Line up images were coloured with watercolour pencils (when do I use anything else.....) and balanced a couple on some Squiggle Arms. That's my 3rd guest DT post, only one more to go- pop over to the Stampotique Designers blog to have a go at the challenge yourself. I'm entering this into the Simon Says Monday challenge, which is cameos- acetate has made a cameo appearance here, although considering how pleased I am with how it's turned out, it might get a regular role! Aw thanks Kay, what a lovely thing to say! You're right, the challenge was a good 'un. I mean, they're not called challenges for nothing, right? Fabulous repeat stamping with that hexagon and a great save from the ink pad splodge (been there, done that!). Thanks for joining us in the Craft Stamper challenge! Super cute card! So colorful and fun! Great way to showcase acetate! Thanks for joining along with Simon Says Stamp Monday Challenge! Absolutely delightful! Great, vibrant colors! 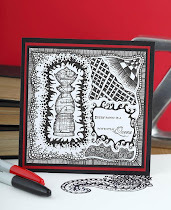 Thanks for playing along with the Craft Stamper challenge! Fabulous bright card Lisa, love it! Thank you for playing along this month with the Craft Stamper Blog challenge!